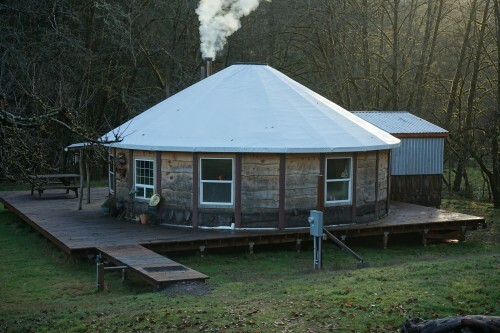 For sale is ‘The Orchard Yurt’, our custom-built wooden frame panel yurt, built on a large deck with attached bath house, outdoor kitchen & storage area, and wood shed. Located in Alsea, OR. 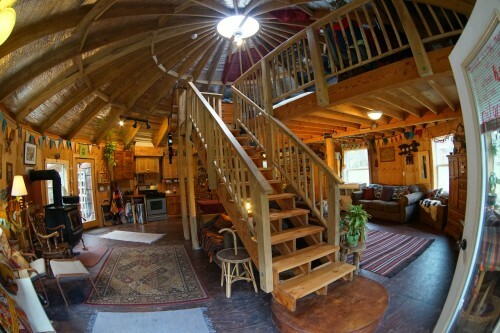 This is truly a beautiful and unique building – perfect for the aspiring self-builder! A 30 ft diameter wooden frame panel yurt with loft, built on a 44 x 42 ft deck. The Orchard Yurt is designed as a modular building, has a building permit and comes with engineer stamped plans. This would make a cozy round home, a convivial gathering and meeting place, or a welcoming retreat space. If interested please contact us for a tour, and a conversation to learn more about it. Construction: This yurt is designed to be deconstructed and rebuilt without any specialist skills. As such, having some basic carpentry and construction skills would be necessary to rebuild. 750 sq. foot interior floor space and 325 sq. foot loft. Elegant custom milled 2×8” White Oak rafters. White Oak compound compression ring. Stunning stairway, featuring reclaimed White Oak handrails, pickets and posts. 4’x8’ modular insulated wall panels with custom milled Western Red Cedar siding. Hand hewn round wood Douglas Fir trunks as posts for loft beams. Exteriors of windows finished with white oak trim, interior trim is pine and cedar. Roof insulated with Ecofoil under an architectural vinyl membrane. Opening skylight, providing plentiful natural light and ventilation. 7 Energy efficient vinyl windows, with screens. 2 Exterior grade window doors framed into 2 of the wall panels. Sanded, stained and finished ¾” plywood floor. Treated 4×4” post and 4×6” beam substructure, treated 2×6” Joists and blocking. 2×6” sanded and ‘cedar’ stained Douglas Fir deck surface. External Bathhouse/Outdoor Kitchen/Wood Shed 8’x24’ structure located adjacent to yurt. The insulated 8X8 bath house is also built with modular 4×8’ wall panels. Includes dry compost toilet, Bath/Shower Unit, Kitchen sink. Blaze King KEJ1107 High Efficiency Wood Stove, hearth, stove pipe and mounts. Marey 16GPM propane instant hot water heater, brand new with 5 year warranty. Many other appliances, fixtures and fittings.